One of the most popular minivans on the road today, the 2013 Honda Odyssey is recognized as being innovative, reliable, and family-friendly. We carry an exciting selection of vehicles including these terrific minivans, for you to choose from here at Middletown Honda. With its confident handling and array of convenience and safety features, there is no other vehicle in its class that can come close to all that this Honda has to offer. 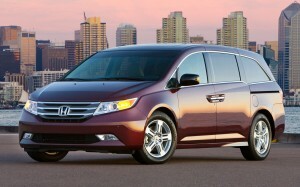 Take a look at how it compares to the Nissan Quest. Powered by a 3.5L V6 engine, the FWD Odyssey LX provides 250 lb-ft of torque, to the Nissan’s 240 lb-ft of torque. EX-L and below models of Honda’s minivan have been efficiently designed to deliver an impressive EPA estimated 27 mpg highway,* as opposed to the 24 mpg highway fuel economy you get with the Quest. Outstanding driving dynamics and fuel economy set the Odyssey apart. The spacious and comfortable interior provides plenty of room for the whole family, and all their stuff too, with 148.5 cubic feet of cargo volume to 108.4 cubic feet available on the Nissan. From the power adjustable driver’s seat to the available rear DVD system, Odyssey drivers get a complete menu of standard and optional features that aren’t available with the Quest. Among these are a stereo system with standard speed sensitive volume and 7 speakers (there are only 4 speakers in the Nissan), automatic headlights, a stereo anti-theft system, and a rearview camera. Noted for its 5-star safety rating from the National Highway Traffic Safety Administration (NHTSA), you get the peace of mind knowing that this Honda is loaded with all of the most advanced safety equipment. With its full complement of airbags, electronic brake distribution with brake assist, stability and traction control, and child proof rear door locks, you and your loved ones can rest assured that you will be safe and secure wherever you drive. We are open from 9 AM to 8 PM Monday through Thursday, 9 AM to 6 PM Friday and Saturday, and Sunday from 10 AM to 4 PM. Visit our Middletown, NY showroom and check out the exciting new Odyssey today. Our address is 520 Rt. 211 East, in Middletown, NY, a short drive from Newburgh, Amity, or Walton Park. Stop by Middletown Honda and let us put you behind the wheel of a terrific new Honda today!